Amazon’s Fire Phone may well already have been on sale in the US since July, but on Tuesday, it’s going on sale in the UK too, so here’s everything you need to know about what has changed since our original review went up. 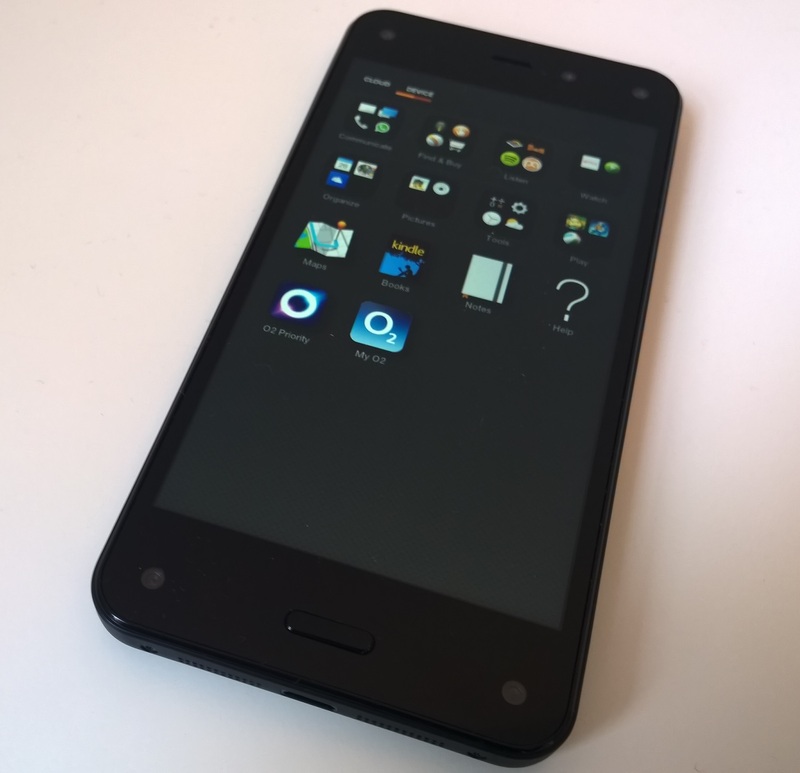 First things first, if you want the Amazon Fire Phone in the UK, you’ll need to be OK with the thought of being an O2 customer, as the network has an exclusive deal to distribute the device – much like AT&T in the US. To my mind, this is completely the wrong strategy – it’s a phone geared around Amazon’s own services and buying stuff from Amazon’s store. With that aim in mind, it should have been offered as widely and as cheaply as possible to flood the market – at a loss if necessary. Amazon’s never been afraid of that in the past. As it stands, it’s available from September 30 for no up-front cost on contract (depending on tariff) and available on O2 pay-as-you-go (PAYG) for £399 – making it cheaper than a top-flight device, like an iPhone 6, Note 4, One (M8) etc, but not within reach of the mid-range really. Strategic faux-pas aside, there have been a few changes made to the device’s Fire OS since it first went on sale. Here are the most notable. 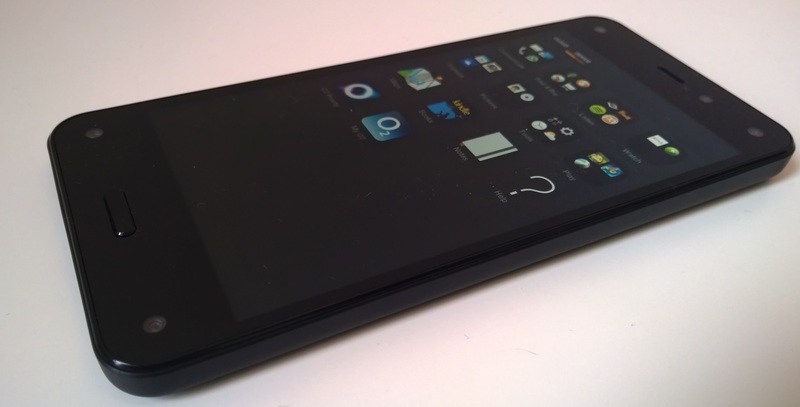 The device, while loosely based on Android, isn’t Android as you know it. As such, you’ll need to relearn how you do a few things – and of course, it’s got all those crazy sensors, which allow you to scroll down pages and tilt the phone to each side to reveal additional content or settings. If that doesn’t sound familiar, go and read our review again. OK, since then, Fire OS has been tweaked to include a few new features, some of which have rolled out over-the-air to US buyers and some of which haven’t. Quick Switch, which allows you to double tap the (slightly protruding) home button to switch between recently used apps. This is a welcomed addition, without it you’re left feeling a bit lost if you’re coming across from ‘normal’ Android when trying to find a recently accessed app. App Grid Collections now allow you to group apps together in your app grid , which really helps to cut down on the ‘sea of apps’ feeling that can sometimes overrun a stock Android device. On a similar theme, you can also now pin your favorite apps front-and-center with the new Carousel Pinning option. Simply long-press on your app of choice (in the carousel, it won’t work from the app list below) and choose ‘Pin to front’. Also on the carousel, you can now delete emails directly from the homescreen, which saves you having to dive into your inbox simply to keep it free from clutter. There have been a couple of minor camera tweaks too, like improved video sharing to allow high-res files to be shared via MMS or email, and an expanded 11 frame Lenticular photo option. 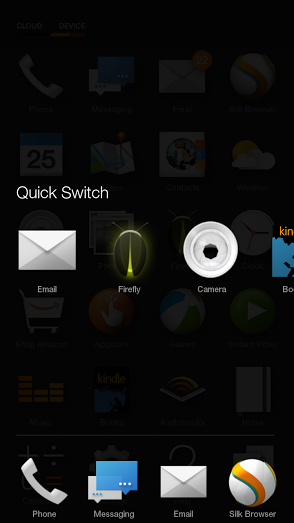 Fire OS 3.6 also brings a new ‘Best Shot’ camera mode, which automatically takes three images and allows you to choose your favorite. If you’re not familiar with the Fire’s Lenticular Photo feature, this basically means that you can take a series of up to 11 images, which you can then navigate by tilting the phone. A bit like a navigable panorama shot. 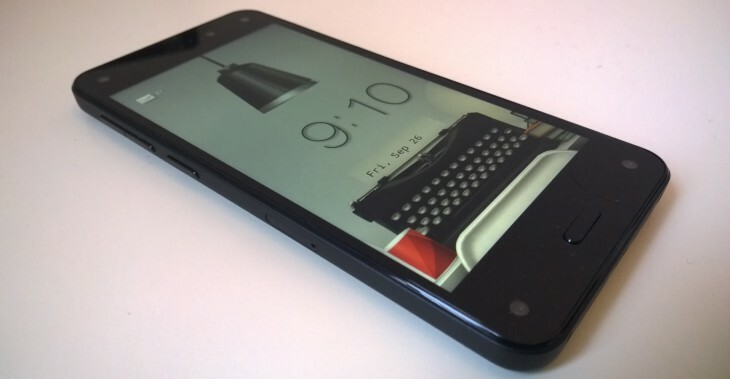 The images can be shared as standard GIFs too, as most of the world doesn’t have a Fire Phone with its fancy sensors. Fire OS 3.6 also brings new features like auto-scroll for the Kindle Reader app and new Firefly recognition capabilities – an experimental translation feature for signs and posters and Wikipedia-linked artwork recognition. Amazon said there has also been “dozens” of system updates to enhance the battery life, but as they shipped me this unit less than 24 hours ago, it’s hard for me to comment on this. 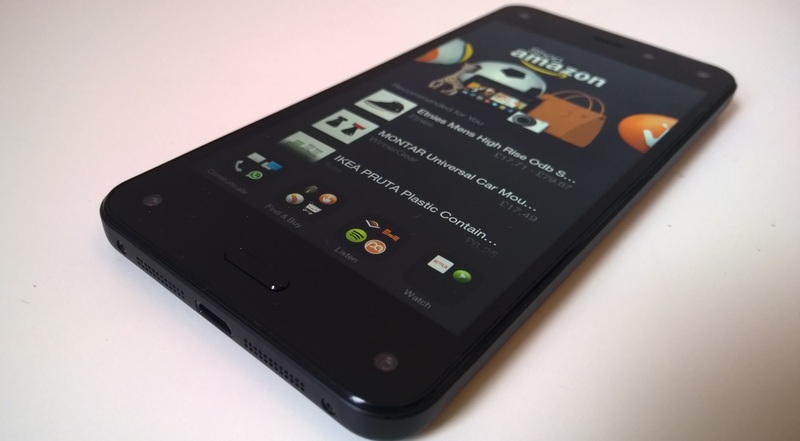 Amazon’s Fire Phone is an unapologetic and unrelenting sales machine. You only need to be looking at an app you have installed on your carousel to get suggestions for similar apps you might like right below. The line between store and phone is blurred in many places, deliberately. That’s not necessarily a bad thing. If you like Amazon’s ecosystem of services and you’re a Prime member then there’s a good chance you’ll appreciate some of the deeper integrations here. It’s worth noting though, Amazon’s Prime Music streaming service still isn’t available here, so that’s not on board, which is a shame. Nonetheless, Spotify is available via the Amazon App Store, so that wasn’t too much of a problem for me. What was, however, is the app situation in general. Yes, there are hundreds of thousands of apps, but without Google’s core apps (Maps, Mail and Chrome predominantly for me), I was left feeling a little adrift. There are, of course, alternatives provided – and the stock Fire Mail and Maps apps are actually pretty nice – but it still felt like a compromise I’d have to make my peace with. For driving purposes, Waze is available via the Amazon App Store, thankfully. Beyond the lack of Google apps, there’s no Play Store either, which means you’re also missing a huge number of potentially useful additions. Is there Instagram? Sure WhatsApp? Sure. But for every big name app that’s there, there are more that are missing – Dropbox? Nope. Pocket Casts? Nope. My favorite password manager? Nope. That last one is pretty much a deal-breaker – and while your ‘deal-breaker’ app might be available, the more you use the phone and look for different apps, the more you find are not available. Many of the big bases are covered, not all – and many of the smaller ones simply don’t exist at all. With so little time, I can’t really attest to the reliability of the device, but the hardware itself was more impressive – and more disappointing – than I’d been expecting. It felt more ‘premium’ than I’d been expecting and I suffered none of the delays when taking photos that our own Roberto Baldwin saw in our original review. Those few extra months to tweak the software seem to have paid off. It also has a better speaker and nice crisp (720p) HD display – albeit, not a full HD (or higher) offering. For all its postives, if you’re coming from Android and are expecting something Android-like, you’ll be in for a shock – it’s just not the same beast and you’ll need to relearn a lot of your navigational cues. It’s not necessarily bad, but it is different. A sentiment that pretty much sums up my first impressions of the Fire Phone.